Clare storyteller Eddie Lenihan years of telling his own children stories at bedtime gave him the ultimate preparation to write children’s books on Irish mythology and folklore. 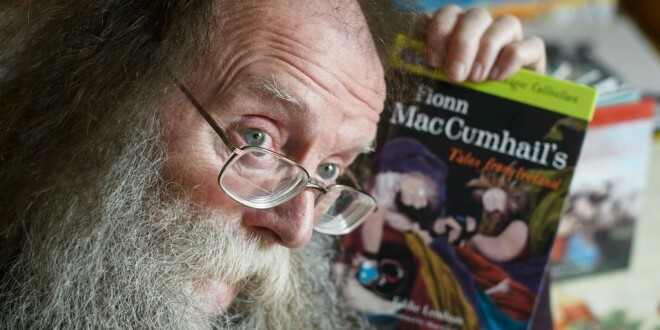 Speaking to The Clare Champion at the time of the re-release of his children’s book Irish Tales of Mystery and Magic, the Crusheen man says children still love a good story. “When my own children were young, I told them bedtime stories and for whatever reason – now quite a number of years later, I don’t know why – I picked Fionn MacCumhail and the Fianna as the story at night time?” he says. Eddie says they are all his original stories but are based on the Fionn MacCumhaill legend, while he maintains all the places, names, settings, characters and, of course, the Fianna. Irish Tales of Mystery and Magic is written in a simple, engaging style with illustrations by Alan Clarke, which bring the stories to life. Yet, do children have an interest in Irish folklore and mythology? Eddie says his favourite story out of the seven in the book has a Chinese connection. “Alan illustrated a story called Fionn MacCumhail and the Feathers from China, where they found out that a better way of doing business rather than beating people to death would be to torture them to death with feathers” he says. Eddie says Fionn MacCumhail and the Making of the Burren is a humorous story that gives a new and unique explanation for how the Burren came to be. “It would be a humorous way of saying how the hell did that come about? I could equally do one on the Giants Causeway and say well how did that come about?” he says. Eddie says Alan was inspired by the stories and that helped him as he attempted to create the images of the characters. “Alan Clarke told me he enjoyed the stories so much that it was easy to illustrate them and I think you can see that. His illustrations were outstanding because he enjoyed them,” he says. Eddie says he now has a greater interest in looking after his energy levels and his well-being and not trying to take on too much. Eddie says he is not bothered by delivering bestsellers and his main focus is on creating a book that young people can immerse themselves in. Irish Tales of Mystery and Magic is aimed at children and young teenagers and Eddie says he still gets a big buzz out of travelling around the country storytelling. Speaking from the principal’s office in a primary school in Cashel, Eddie says he can see in the children that they love the art of storytelling. “The storytelling takes up all of my time now. I’m constantly busy around the country. Sometimes it takes up seven days a week,” he says. Eddie’s fairy book, Meeting the Other Crowd, has just been translated into a number of international languages but Eddie is slightly despondent about the appreciation of Irish folklore in Ireland. “My fairy book, Meeting the Other Crowd, has just been translated into Japanese and it’s in Italian and Irish Tales of Mystery and Magic is being translated into Chinese,” he says. Eddie thinks Irish people have lost their sense of identity. “We’ve got too smart for our own good in some ways but we’ll pay for that. We have paid for that,” he says. He is writing two books at the moment, a novel on the Civil War in his home county of Kerry and another children’s book, so he is kept very busy. However, he says there was no major interest in his home that influenced his love for storytelling. “There was nobody growing up. It was when I was doing my degree in college that I had to go out and listen to old people; I did a degree in phonetics in UCG. And I had to go out and listen to people’s accents in order to hear the phonetics of them and, of course, found out that there were a lot more interesting things than their accents and their stories behind what they were telling me,” he says. Eddie stumbled across the art of storytelling in many ways and he says he believes what is meant for you in life will not pass you by.